A new poll commissioned by NC Policy Watch from Public Policy Polling has some startling news for state legislators who are going to be voting on House Bill 115 today. H115 creates a new health exchange/marketplace in NC under the new national health reform law. Unfortunately, this bill was written by the health insurance industry and puts health insurers on the board of this exchange so they can “regulate” themselves. 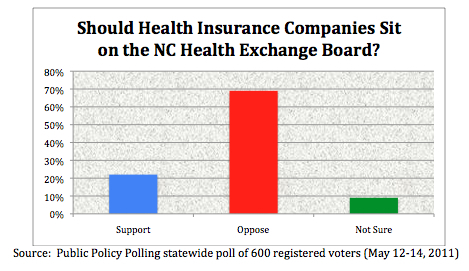 In fact, H115 (Dockham) gives the insurance companies two seats on the exchange board that will oversee the new national health reform law’s health plan marketplace in NC. The Poll Question: State legislators are currently debating a proposal that would give health insurance companies several seats on a new board that will help regulate the health care market created by federal health reform. Supporters say the companies will bring important expertise. Consumer advocates say the insurance companies should be kept off because they have a conflict of interest. Do you think this is a good idea?